I can’t tell you enough just how much I adore Astrology Zone by Susan Miller. An astrology site I happily came across through the Samantha Wills blog about a year or two ago, and man I seriously can not thank her enough for introducing me to Ms Miller’s astrological wisdom and insights. She is incredibly accurate and provides comprehensive, monthly forecasts all for free. Yes lovers, free! Please note this isn’t a sponsored post, I just felt compelled to share some love here, and hope it will help someone out, just as Samantha did for me all those years ago. So I am wondering, are there any astrology aficionado’s here? I am obviously a keen reader myself and those in the know will be aware of another temperamentally bitchy Mercury Retrograde approaching us towards the end of this very month. 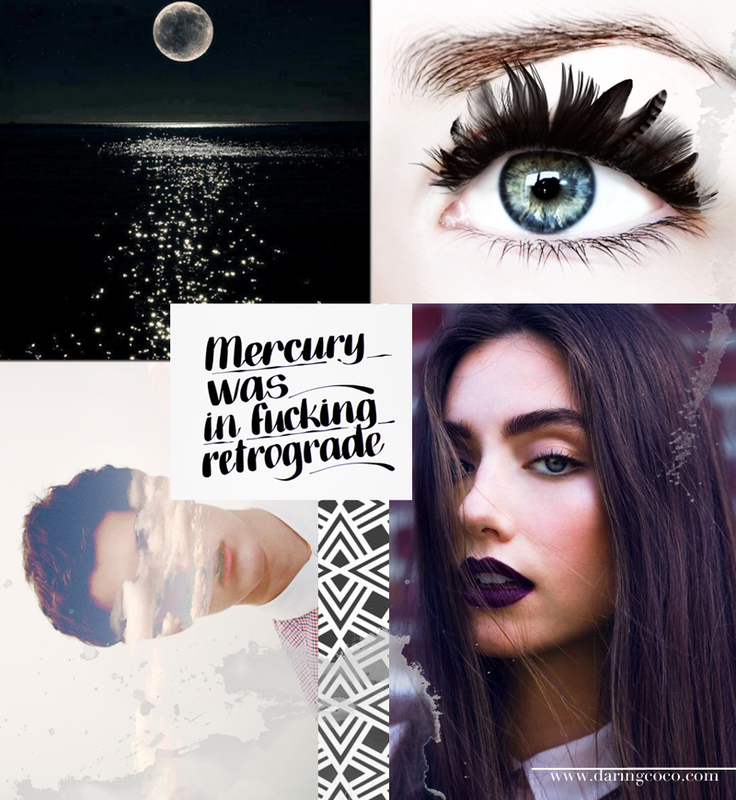 You don’t quite know what a Mercury Retrograde is? Well I’ll hit you with some knowledge. Think back to February this year. Remember how there was an undeniably crazy week or two when everyone, I mean everyone was in a mood and you may have found that your well thought plans went disastrously awry? Everything was erratic and all over the place? Yes, that was because Mercury was in f***ing Retrograde. Much like the moon effects the rise and fall of the oceans tides, Mercury also effects our moods. Like the new moon which brings out everyone’s crazies. Well Mercury Retrograde has a way of messing with you. Big time. Mostly with people’s mood and electronics. Ms Miller always advises against making expensive purchases like vehicles or investing in technology as they have a tendency to be plagued by misfortune and technical errors. So with Mercury Retrograde approaching us, we are in for yet another unwanted ride. Oh joy! So to be the bearer of unwelcome news, all in all this month is going to be tricky for us all, so Godspeed people.